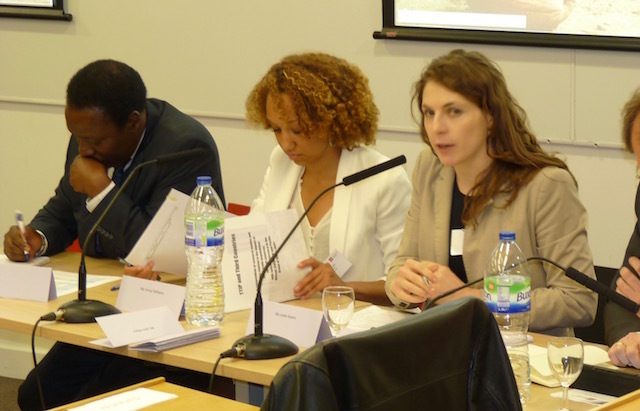 The Ramphal Institute and London School of Economics in association with the ACP Secretariat, GIZ, War on Want and CUTS International organized a symposium on the possible ramifications of TTIP for ACP countries’ trade and investment interests. According to the organizers, the purpose of the symposium was to deepen ACP policymakers’ understanding of this mega-RTA and its deeper and wider commitments on an array of trade disciplines. The symposium provided a valuable opportunity for the ACP actors to engage with leading researchers and experts in the field and familiarize themselves with the latest thinking and research. Invited participants included ACP regional and national policy makers, business leaders, ACP Representatives in Geneva, High Commissioners in London, EU and US representatives, academics, journalists and civil society representatives. promote the TradeCom II Programme’s work in support of ACP countries and regions to improve their trade capacity. The mission was undertaken by the Team Leader, Ahmed Ndyeshobola. The symposium provided ACP actors with an opportunity to make an initial assessment of TTIP’s possible impact on the Group’s trade and investment interests. The symposium affirmed that the TTIP is one of the elements of a changing global trade and investment environment in which new rules and norms are emerging and new players are becoming increasingly important. Changes are far-reaching and are affecting all areas of international trade, commerce, rule making and standard setting. It was noted that while TTIP should create valuable opportunities for ACP countries to advance their trade and development also in the context of the SDGs, it can pose new and fundamental challenges as they seek to industrialize and move up the value chain. ACP countries doubtlessly welcome the benefits that the EU and the US will secure from the TTIP once these are reconfirmed by the sustainability impact assessment studies. However, they would be understandably dismayed if a collateral consequence of those gains is the setting back of their own economic development. The participants’ collective concern extended to the mega-RTA’s direct impact of both preference erosion and trade diversion. It was generally agreed that such developments could impair ACP economic interests by diminishing the competitiveness of the Group’s exporters and excluding them from global value chains. However, participants also recognised a slate of additional effects, most notably, subjecting ACP countries to more demanding trade rules via negotiations in the multilateral, bilateral, plurilateral spheres and WTO accession process. Conduct a detailed technical study on TTIP and TTP’s impact on third countries, most notably on the policy space of ACP Members. The ACP should develop a political strategy to apply pressure in the WTO complemented by the Group taking the initiative of tabling concrete proposals in the MTS. Initiate policy debate on whether the use of privatised education and health services results in better outcomes, and more specifically, areas where TTIP might pose an adverse effect on education and health. In this context, the ACP was encouraged to collaborate with international bodies such as UNICEF, UNESCO, and teachers and nurses trade unions, etc. Placing the Implications of TTIP on ACP States on the respective agenda of the next meetings of the Joint Parliament Assembly and ACP-EU Ministerial Trade Committee. Deploy the approach of the Trade Facilitation Agreement to a broader set of regulatory issues in both the MTS and EPAs. The ACP should consider a strategic approach to mega-RTAs that entails either the multilateralization of regulations e.g. via mutual recognition agreements or developing a model MRA for ACP Members to use as a template to engage with key trading partners.